We have a good flight to Mandalay. It is a short distance flight so the plane is flying at a low altitude. Therefore, we can see a lot. We see many plots below us. Green, yellow (sesame), each plot has been edited. We see winding roads and rivers. The plane lands exactly on time at Mandalay airport (map). It is a fairly modern looking airport. Handling the flight goes smoothly. We are neatly picked up by a guide and driver at the airport. 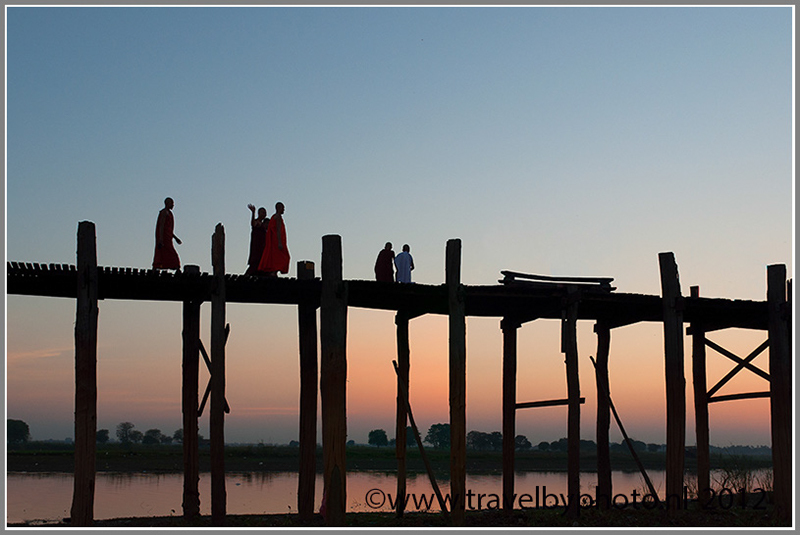 We ask the guide if there is still enough time left to visit the famous U Bein Bridge because today is our only possibility this journey to visit the bridge by sunset. Fortunately there is enough time so we can go. It is still quite a long drive from the airport to the bridge. When we arrive at the bridge we don’t know what we see. Bizarre! 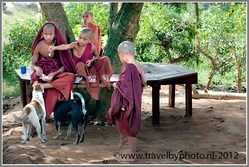 All tourists of Myanmar have united here! 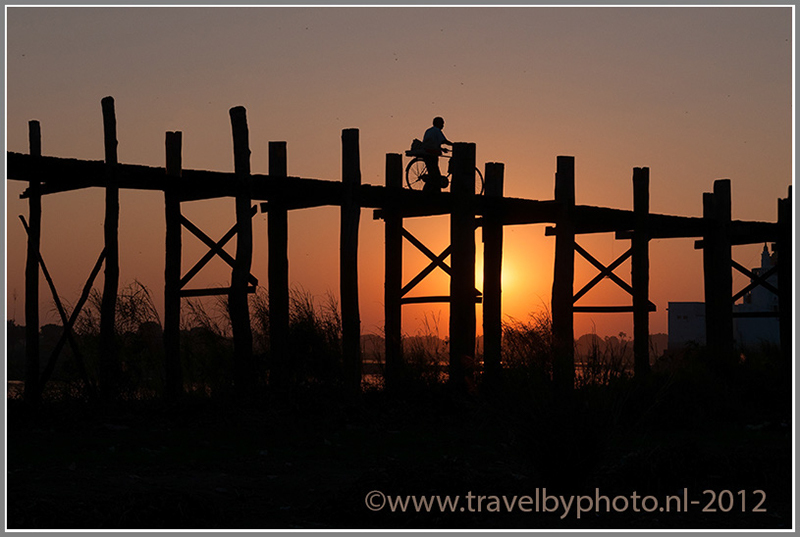 Tripods on a row, expensive lenses, and hundreds of tourists on, under and near the 1200 meter long wooden bridge. We are glad that we made it and it is certainly worthwhile, but we did not expect it to be so crowded! But all right ...... we are of course not different than the other tourists and with much tact and patience, we succeed to make some beautiful unique pictures of the bridge, with monks on it in the sunset. When it is dark we drive right across Mandalay to our hotel. Mandalay is a large vibrant city. At the request of our guide we visit a clothing store on our way to the hotel. She will have her connections there. We buy a blouse, but it's also not very special. At half past nine in the morning we leave the hotel with guide / car. This guide is a different type as Su-Su. She is very professional, but there is no real connection. We drive to Ava, just outside Mandalay. Ava is an island in the river. Once there was a big city on Ava, but the city is destroyed. Now, the farmers have taken possession of the island. We go by boat to the island. On the island are no cars, only mopeds, cyclists and horse and carriages. There is already a horse and carriage waiting for us as our boat docks. It's a fun ride though the trolley is very small and the roads are quite bumpy. We are really shacked up. There are a lot of tourists on Alva. Big groups. Especially a lot of French. Fortunately, we always keep the crowd behind us so we are able to visit the different hot spots on the island together in relative peace. We visit ancient ruins and stupas with beautiful Buddha images. There is a nice old monastery on the island. The monastery is entirely built of teak. Big thick high trunks are used as pillars. 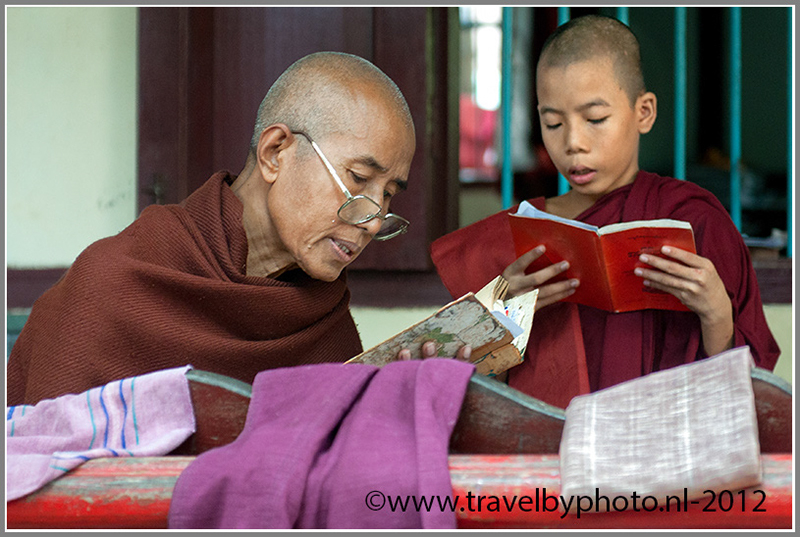 Only a few monks are present in the monastery. 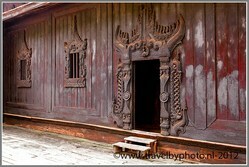 Close by the wooden monastery is a large stone monastery. Or is it a palace? It is closed because there is a lot of damage inside the building caused by the earthquake last week. At the end of our tour on Ava we stop at a restaurant and use consumption. 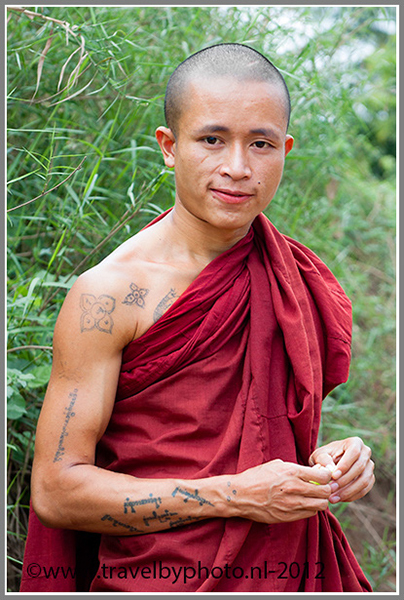 When we leave the island by boat again we are accompanied by a monk with many tattoos on his body. So many tattoos on a monk, it is the first time that it strikes us. 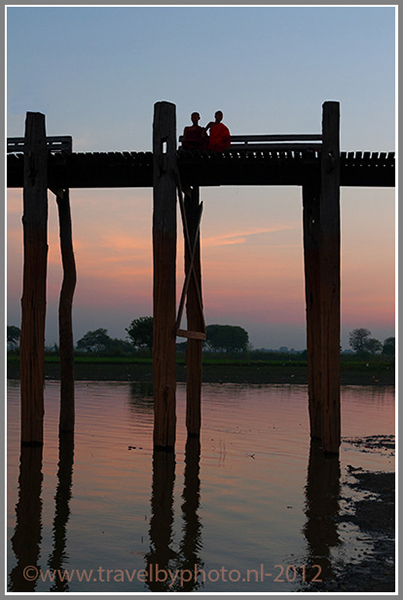 Ashore, our guide returns to Mandalay to pick up new customers at the airport. 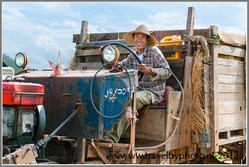 With only the driver left we ride on towards Hsipaw. The driver is a very nice man but he doesn't understand a word of English. In Pyin Oo Lwin he selects a nice restaurant (The Terrace Club) for us to lunch. It is a wonderful stop; large terrace in the shade with lots of flowers around us and many butterflies. The food was great and not expensive. 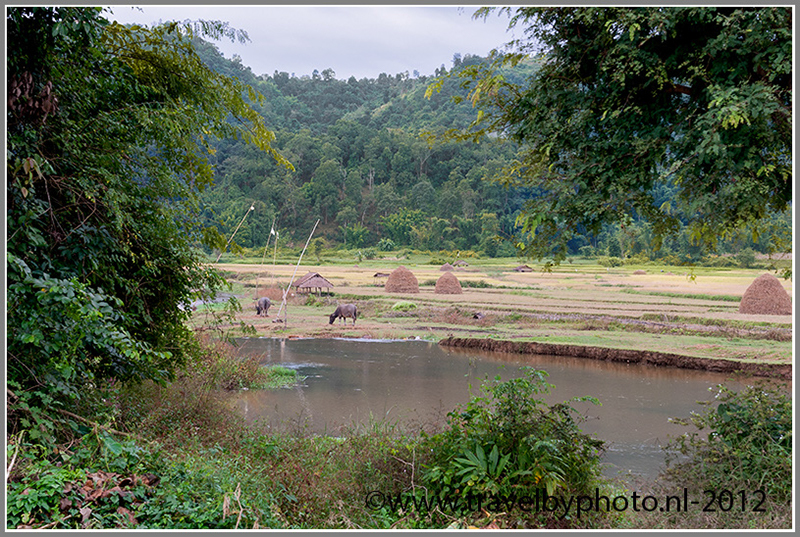 After lunch it is still a few hours drive to Hsipaw (map). 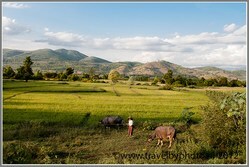 It is a beautiful ride through green fields, over hills with hairpin bends. At many locations corn is drying in open barns. Beautiful trees also, some known but many species unknown to us. We see parasite plants snaking along the trees. At five o'clock we arrive in Hsipaw at Mr. Charles Hotel & Guesthouse. At Mr. Charles you cannot eat and there is no cosy seating area. So, it doesn't take long before we leave the hotel again in search for a restaurant. We find a nice Chinese restaurant at the end of the street. Tasty food! We receive a message from our daughter Marjon on the Internet (Facebook). She and her friend Bram have just returned from a very successful diving holiday in Egypt. Nice! 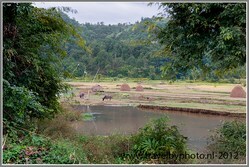 Our walk takes about 4 hours and leads us through Shan villages. A clever guide accompanies us. 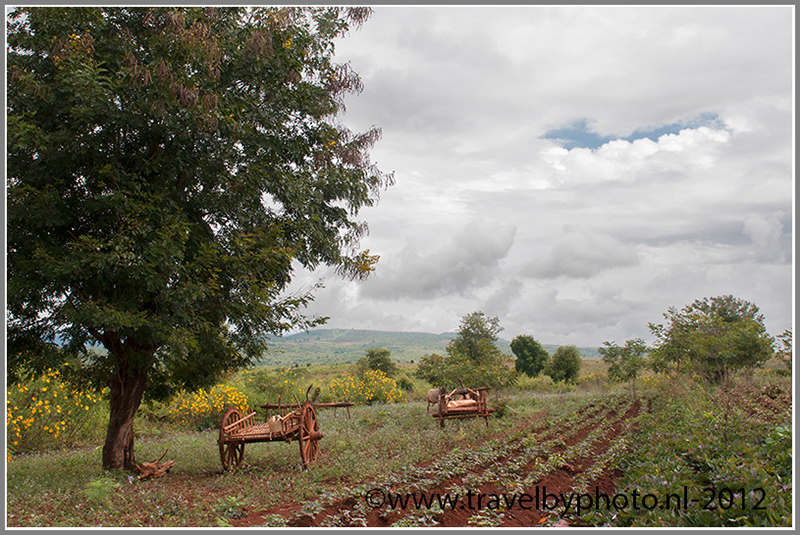 He tells us a lot about the villages, its occupants, the way they live and the vegetation. It is an interesting walk along small paths. It is very quiet and peaceful. 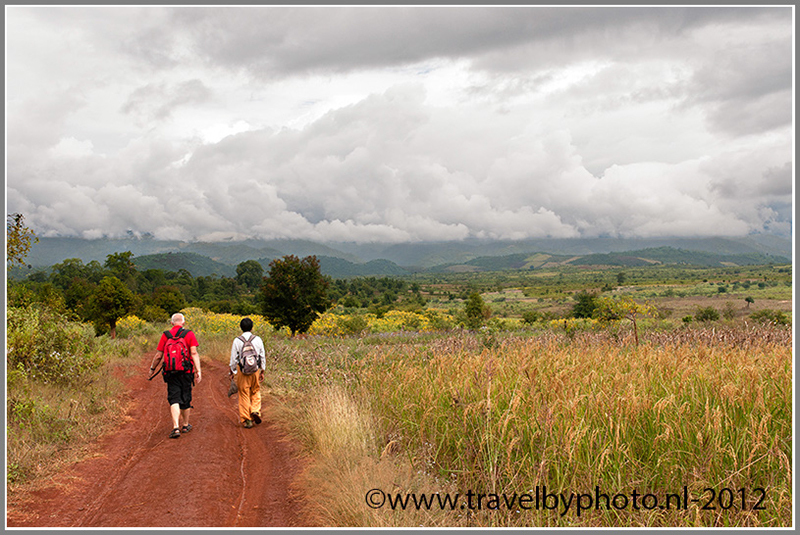 We walk past rice fields, corn fields, mimosa trees. We are surrounded by beautiful flowers and many butterflies. 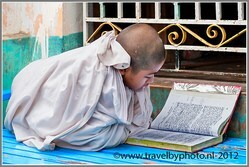 We also visit a man's (boys) and a women (girls) monastery. Our guide speaks a lot about politics. We notice how pretty open and critical he dares to speak about the regime. He explains to us how the mineral resources are squandered. The people here don't benefit the sell out to particular China. That is sad. 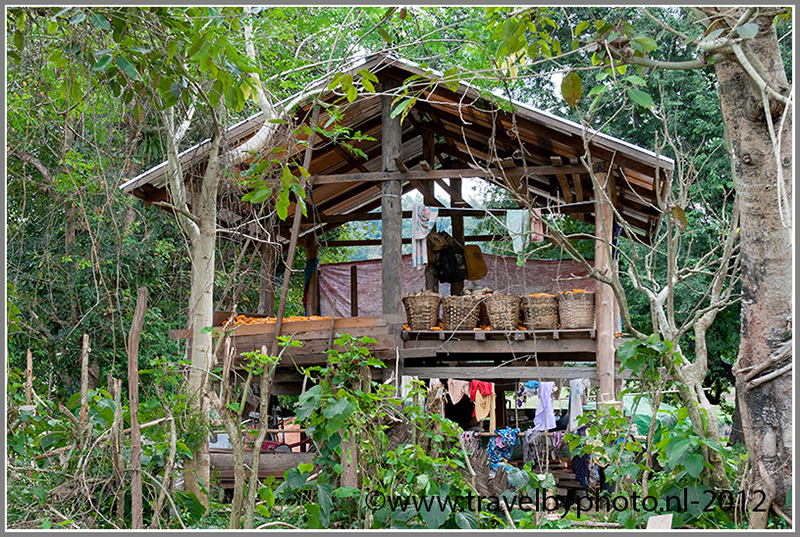 We drink tea in a house/shop in one of the small villages. 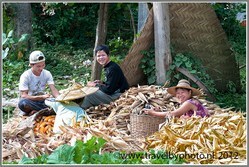 It is harvest time in this area. 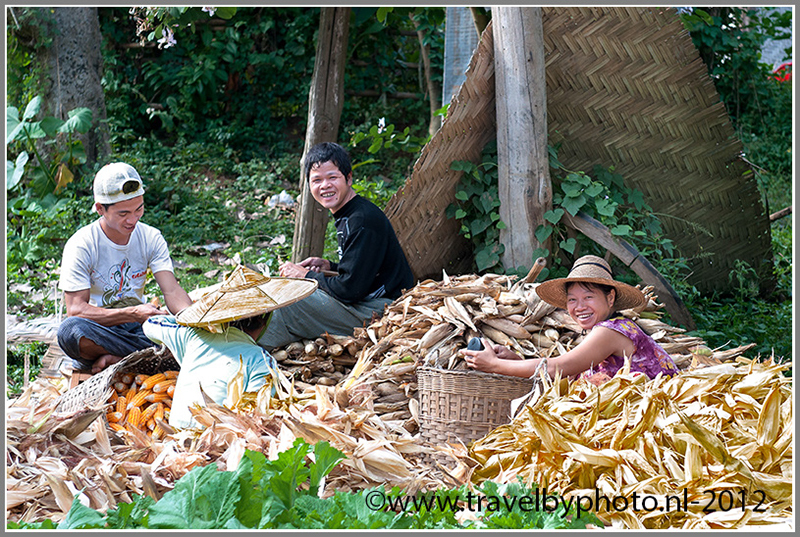 Everywhere you see people peeling corn to get rid of the leaves. The cobs are left to dry in shelters. The people don't appeal rich, but the houses are well maintained and you see almost always a few pigs and some cattle stroll around the house. Lots of fruits and vegetables. The basic needs can be met. We are always welcomed with open arms. The temperature is high. Humid heat. We sweat a lot! After our walk we try to rest in our room , but that is not easy. A lot of noise at the neighbours. Right next to the hotel and so next to our room, a newly hotel is built. We wonder why they leave so little space between the buildings. When the newly build hotel is finished you can literally jump from balcony to balcony from one to the other hotel! We conclude the afternoon with a short walk through the village (not very special). It has been raining all night. While having breakfast it still rains. After breakfast we walk to the bus stop. Today we travel with a local bus from Hsipaw to Kyaukme (map). Fortunately it is dry when we arrive at the bus stop. The bus leaves at 7:30. The people of the bus are very thoughtful. They make room for us in front of the bus, so we can sit well while having the perfect view on everything that happens outside. This is fun. 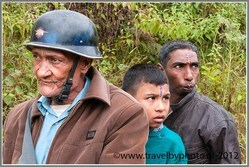 The bus stops at every small village and we are surrounded by locals . We are the only tourists. Many people go in and out, it is busy in the bus. Just after half nine a.m. we are Kyaukme. In Kyaukme the organisation fails for the second time in two days. We would be picked up at the bus stop but there is no one there to accompany us to the hotel. So we wait, ..... and wait. It becomes clear that we can wait forever but that it will be in vain. We start doing some checking. 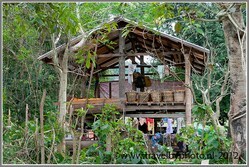 We learn that the hotel: A Yone Oo Guesthouse is located not far from where we are now. We decide to walk to the hotel by ourselves (luckily our heavy suitcases are on wheels). Arrived at the hotel there is still no one who can give us some information. Annoying while we would leave immediately after arriving for a day trip to the mountain villages by moped and that plan is now in danger. 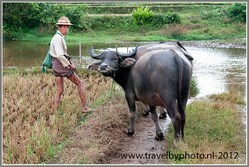 Eventually we manage to contact Khiri Travel. 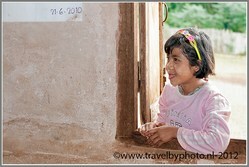 Shortly thereafter our guide accompanied by his daughter arrives at the hotel and our "problems" are solved again. It seems that the increase of tourism is difficult to handle for local organisations. 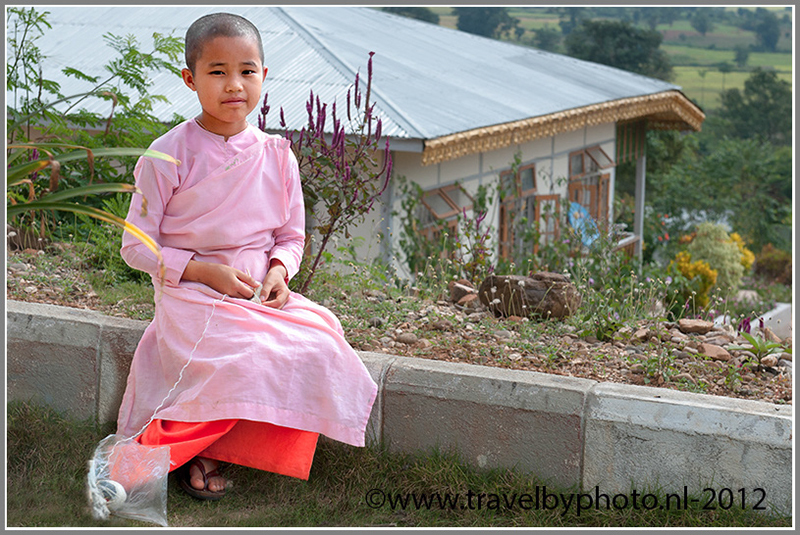 This year there are up to 80% more tourists in Myanmar than last year. 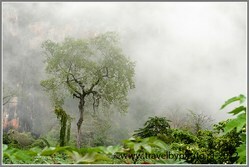 It is very difficult to travel unorganized in Myanmar nowadays. All hotels are booked. 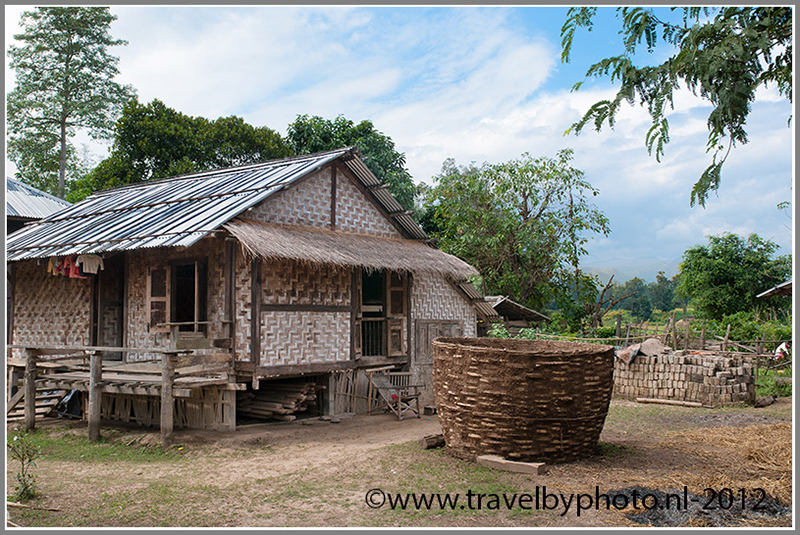 We talk to people who are used to travel all over the world on their own but now in Myanmar fail to find unreserved economical hotel rooms. They are therefore unwittingly obliged to rent rooms for over $ 150 per night!! So if you plan a trip to Myanmar: beware there is a shortage of unreserved economical accommodations. Our guide is called Mr. 99. His name is Mr. Naing Naing (naingninenine@gmail.com), but he calls himself for convenience Mr. 99. It's a nice man and a local celebrity! We don't drive the motor ourselves because the road it is very slippery by the rain. No problem, Ingrid climbs on the back of the moped with Mr. 99 and Jan-Arend on the back of the moped with his daughter Honey. And there we go. 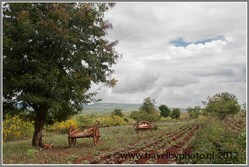 After a while we put the bikes aside along the road and walk to the villages. We walk on paths of reddish earth between fields of beans, corn and flowers. If we look at some girls who are cleaning parsnips we are invited to come inside the family house. On the patio we get coffee, tea and passion fruit served. Tastes delicious! There is a poster on the wall of two Asian ladies in a Dutch landscape with flower bulbs. Wherever you want to look you are heartedly welcomed. Piles of corn are processed here. We visit a school where all children spontaneously get the giggles when they see us... Jan-Arend writes his name on the board, a girl writes hers underneath. Fun! 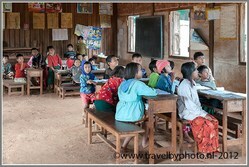 99 explains that education in Myanmar is still very poor. Not everyone can get education and school focuses more on chanting rows (indeed often heard) then on independent thinking. Children are not trained in the application of knowledge. A teaching method that is not very stimulating for the development of intelligent children. Mr. 99 talks with enthusiasm about the recent political developments; 20 years ago we lived in a closed box. Now we have a window and the door is a little open. Things are getting better but we still have to be careful and we have a long way to go! Beautifully said! The school is incidentally sponsored by Japan. Today it occasionally rains a bit, but not really bothersome. We pass a bullock cart with Nepali. They are beautifully decked out for the Diwali festival. 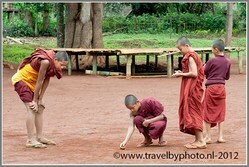 As we continue our walk we arrive at a small village-monastery with many playing children (play at marbles). 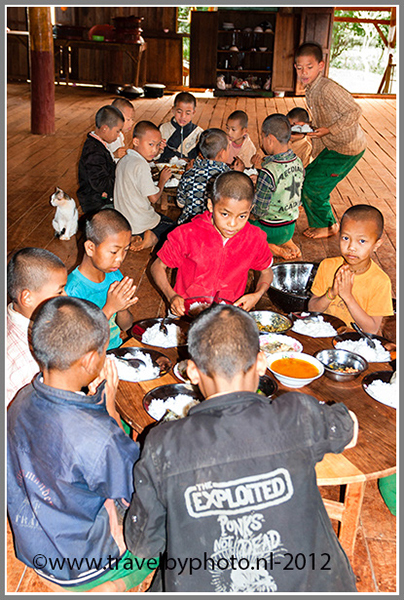 This monastery also takes care of some poor children and orphans. The kids get their food while the (small) monks have to watch. The monks only get one meal a day and they already had their meal for today. We walk between hedges of yellow daisies and fields of drying Chilli peppers back to the bikes. In a large pool water buffalos are bathing. It's starts to rain harder, but as always a solution is in reach. A Nepali family invites us in for tea, coffee and snacks, in honour of their Diwali party. The heads of the Nepali are painted and they are hung with garlands. We have lunch in the house of Mr. 99 himself. His wife is also there. Mr. 99 leaves to buy us food. The food he brings back is very tasty. 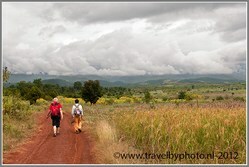 Mr 99 is a proud man who also organizes treks, even until 2 or 3 weeks! 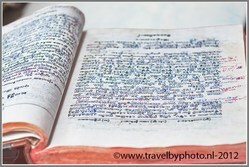 He shows a notebook full of comments of people with whom he has walked. 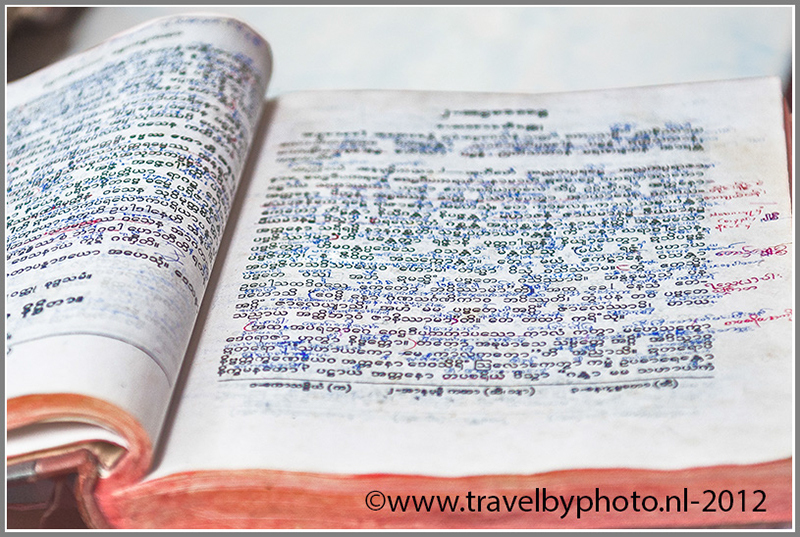 He even shows a copy of a page from the Lonely Planet in which his name is mentioned. Mr. 99 says that he only fallen 1x with the moped and a tourist on the backseat. Should that notice reassure us??? After lunch we continue our tour. It starts to rain again. We stop en route and enter a random house to shelter. Without any hesitation we are welcomed. The unexpected hosts serve us tea and biscuits! 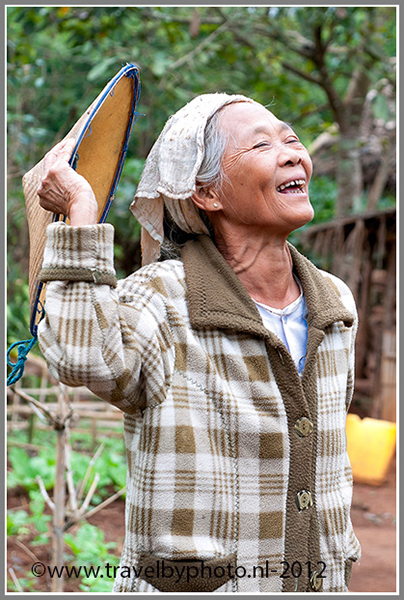 Very special all the kindness, attentiveness and .... curiosity of the people here in Myanmar. After the rain stop we drive to a beautiful rural location. 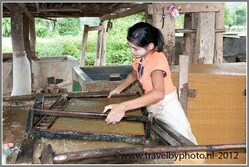 There is a mini bamboo factory, where they make handmade paper of bamboo pulp. The paper is not for sale in Myanmar. It's made for the export to China where they use the paper to write on a final farewell to a deceased; a message for the dead! The road ends at a cable bridge. The surface is full of holes and bamboo mats are used for temporary repair. The bridge doesn't look very solid but the landscape at the other end of the bridge is superb. That is why we happily take this hurdle. Farmers are working hard on the land with water buffalos as beasts of burden. Honey explains giggling that this spot is the ideal meeting point for couples in love on their day off for a romantic get-together. We get on the mopeds again and drive home. 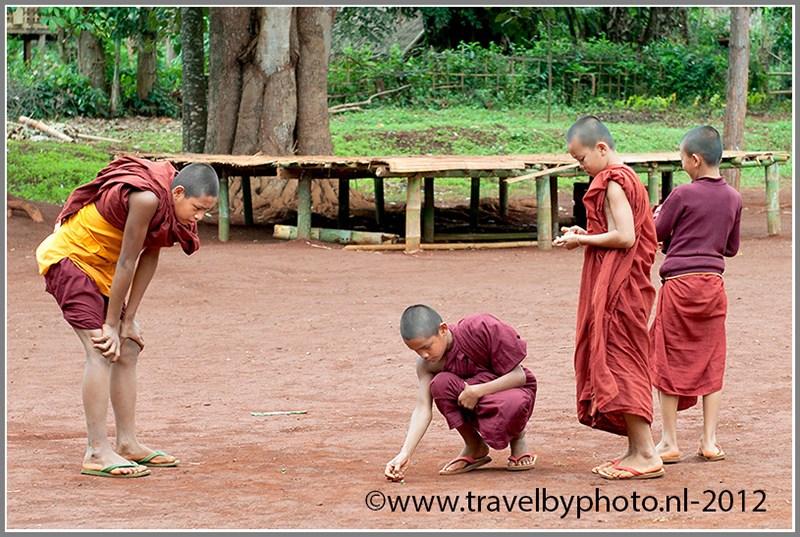 We pass a large Buddha statue where young monks are playing. At five o'clock we arrive at the hotel. We say goodbye to Mr. 99 and Honey. Mr. 99 and Honey, have contributed a lot to this real nice (full) day with their skilful and cheerful guidance! Highly recommended. In the evening it rains again seriously. We wonder if we have enough energy left to go out through the rain, but we ended up doing it anyway. And sure enough, it becomes dry. We find a nice local restaurant and eat rice with cashews. Delicious! We slept well (as of 21:00 p.m. last night). After breakfast we go to the market. Outside all the stalls are covered by plastic sheets because of the rain but we also find a covered market. That is better: dark, but dry and fun! On the market there are many stalls with Buddhist books, all sorts of strange looking medications and so on. We buy some stocking stuffers. Back at the hotel we still have some time. Mr. 99 will come for us at 11.30 a.m. He will accompany us to the train station. 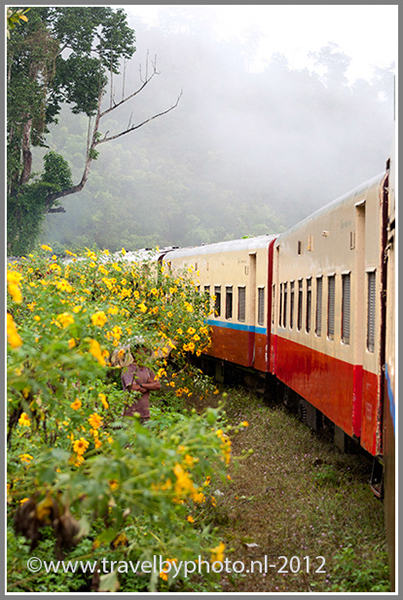 Today we travel by train to Pyin Oo Lwin (Maymyo (map). At the station Mr. 99 hands us a bag with two cans of coke and a packet of biscuits. So thoughtful! He wants to wait until the train leaves but the train has a 40 minutes delay so we say to him that he can better go. 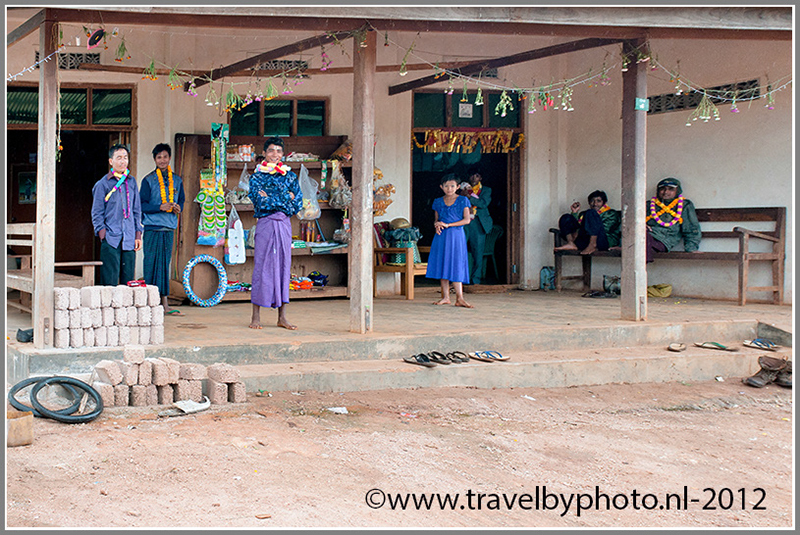 Train stations are wonderfully colourful places and Kyaukme's train station is no different. It is a great place to watch people so we have no problem enjoying ourselves while waiting. Eventually the rain arrives and we leave. We can both sit at an open window. We sit on wooden benches. The landscape glides past us. The train makes many stops. Vendors at the stations with all kinds of eatables on the head walk along the train trying to sell something. Along the track are a lot of yellow flowers, kind of large yellow daisies. The flowers grow very close to the rails and because we sit at an open window, we are bombarded by petals and buds. We let it happen. Too much fun, that open window! 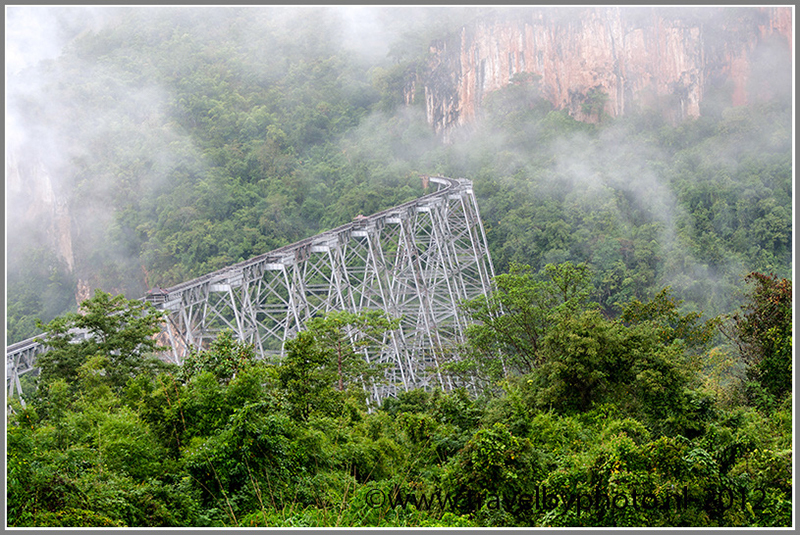 During this beautiful train journey through the Shan mountains we cross the Gokteik-Viaduct, constructed by British colonialists in 1901. Gokteik was once the longest railway trestle in the world. Stretching 689 meters from end to end, the viaduct has 14 towers and is over 100 meters high. 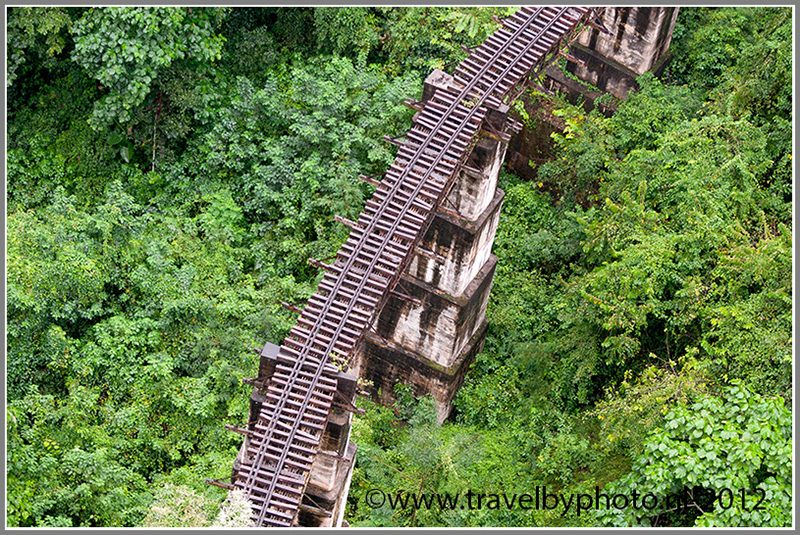 The train moves walking speed across the bridge, which may have been the epitome of engineering when it was built but now is a crumbling antique, which only adds to the white-knuckle high-wire act experience. The engineer goes as slowly as possible to avoid the rocking motion that will further damage the bridge and, possibly, plunge the train into the river below. 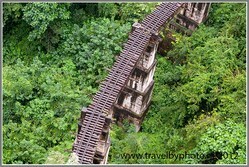 Crossing this bridge is an experience you will not forget easily! 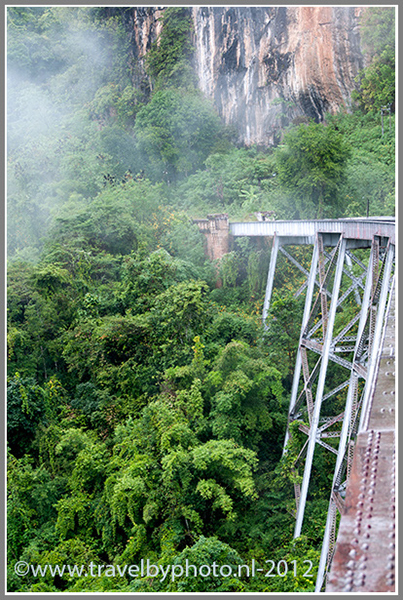 By five the train arrives at Pyu oo to Lin station. Outside the station a row of wooden horse carriages is waiting to serve as taxi for the passengers of the train. We had already seen them here before. The carriage looks like a simple version of fairy tale carriage, with one horse. For us a car is waiting. We are neatly picked up and brought to our hotel: Royal Parkview Hotel. The Royal Parkview Hotel is a nice hotel located between colonial villas near Botanical Gardens. It shows pretty nifty! We are welcomed with a warm cup of tea. Tastes good! We have great room. There should be free wifi, but it is difficult to get a good internet connection. We see a flyer that shows that we had our lunch here a few days ago. The lunch was great so why looking around for a restaurant. We take the opportunity to have diner here in the hotel. And rightly so. Dinner is delicious, rice, chicken and cashew nuts, and rice / chicken / pineapple. For the first time this holiday, we ordered a bottle of real French wine! At 8 a.m. we are picked up at the lobby by a shared taxi. 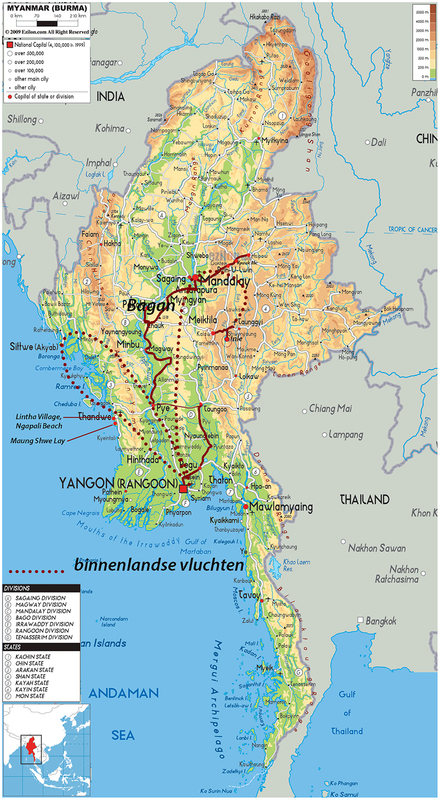 Today we will ride to Mandalay (map). There are no other passengers in the taxi; so no one else to share the old car with but the driver and his sidekick. They are two strange guys. Jan-Arend tries to make some contact. Up to 4 times he says "good morning", but no response. The two men avoid eye contact and say nothing. So we drive the Road to Mandalay. En route the chauffer stops one time to buy some packages with betel. He and his sidekick chew continuous on the betel. Occasionally they spit the chewed betel pasta out of the open window immediately followed by putting in a new package to chew on. It's crowded in the Mandalay. Many scooters packed with chrysanthemums on the back going to the market. Our two autistic drivers can't find the right route to our hotel. Ingrid tries to make the driver aware of a billboard she sees of our hotel with a big arrow to show witch direction to go, but the driver looks at her a moment and then just turns the other / wrong way ..... again. And so we drive around for more than half an hour. Stupid guys! 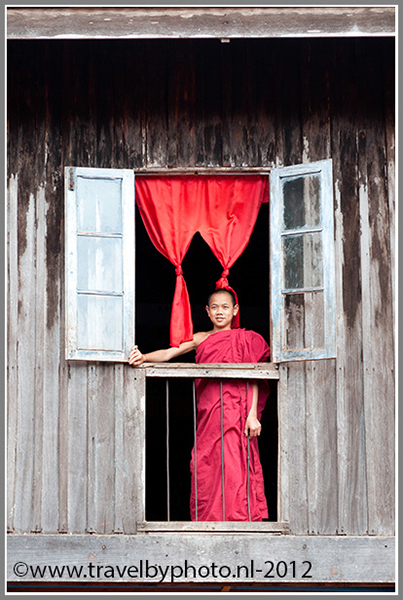 It is the only time that we have really met such louts here in Myanmar! When we finally arrive at our hotel, the suffering is quickly forgotten. There is a nice guide waiting for us. He will accompany us in Mandalay today. We have tea and discuss what we want to see and do. We only have one day in Mandalay; this evening we will fly to Yangon. So we have no time to lose. We have slightly modified the plans. 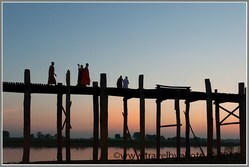 Our guide has some sights selected (U Bein bridge/Ava) that we have already seen. 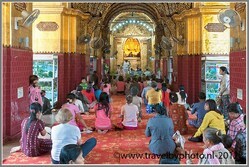 The first sight we visit is the famous Mahamuni Buddha Temple. 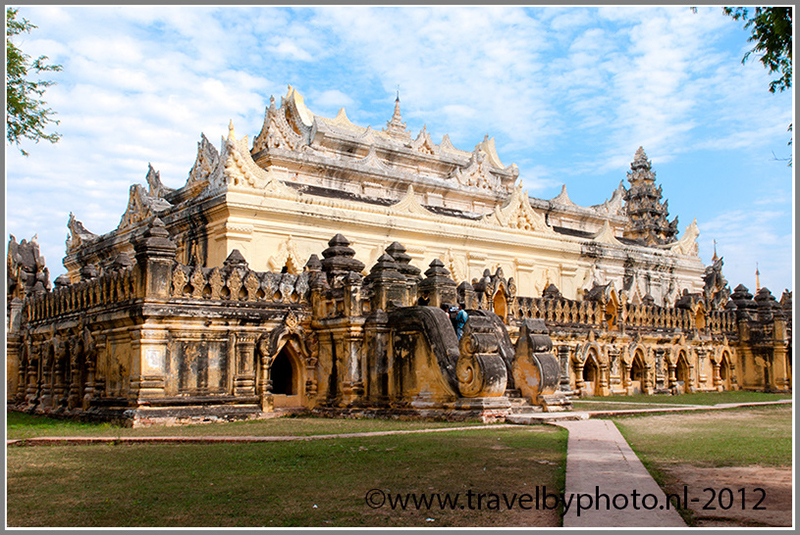 The Mahamuni Buddha Temple is a major pilgrimage site. 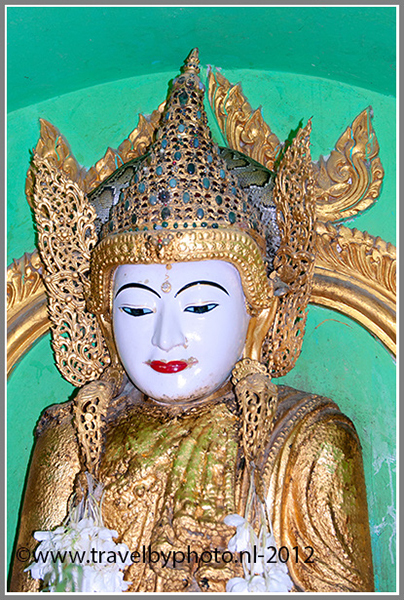 The Mahamuni Buddha image (literal meaning: The Great Sage) is deified in this temple. 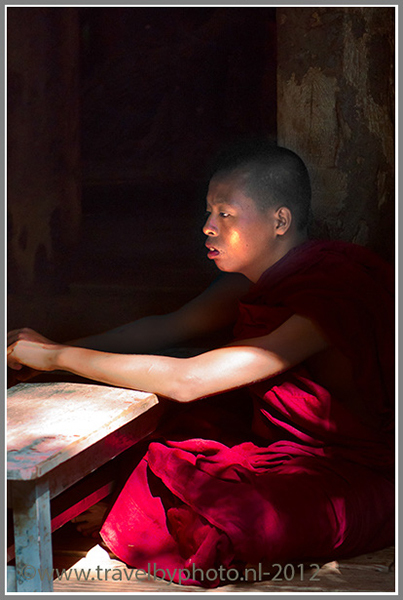 It is highly venerated in Myanmar as it is seen as an expression of representing the Buddha's life. Ancient tradition refers to only five likenesses of the Buddha, made during his lifetime; two were in India, two in paradise, and the fifth is the Mahamuni Buddha image. Jan-Arend climbs the stairs to the Buddha statue. Men may come close and rub the Buddha. Women are not allowed. Many people kneel on the ground. Money and flowers are offered but we also see a monk just enjoying smoking his cigar in the middle of the temple. That doesn't show very sacred in this sacred place. There are also some antique statues that you may touch. The idea is that you rub it on the part of the image where you yourself have load (stomach, throat, etc.). 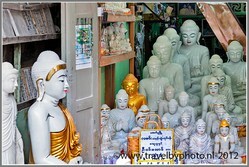 After visiting the temple, we go to the street of the sculptors. In the street are many Stone sculptors' workshops in line. 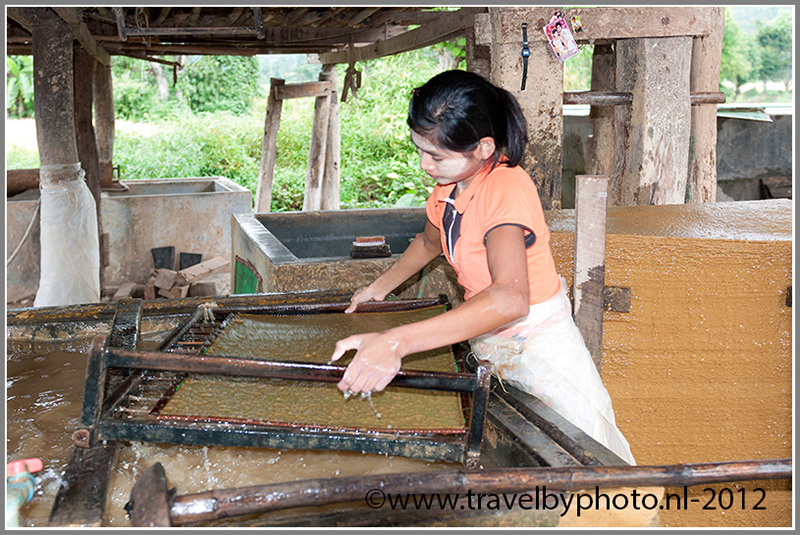 Stonecutters cut the images of Buddha from marble, jade and other (precious) types of stone. Large numbers Buddha's, big and small, are displayed for the stalls. We buy some small Buddha's. Our tour continues with a visit to the Mahagandayon Monastery. 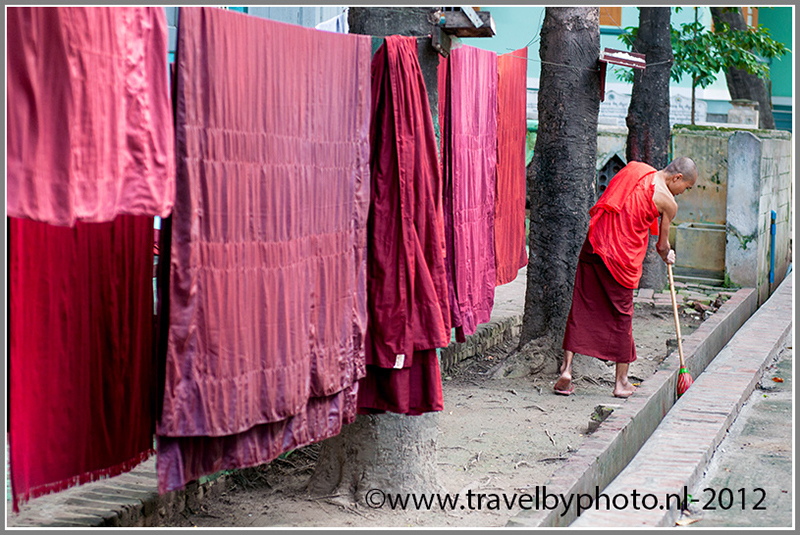 In this largest teaching monastery in Myanmar more than 1700 young monks are housed spread over several buildings. The Monastery was founded in 1950 and has a good reputation for academic, Buddhist education. 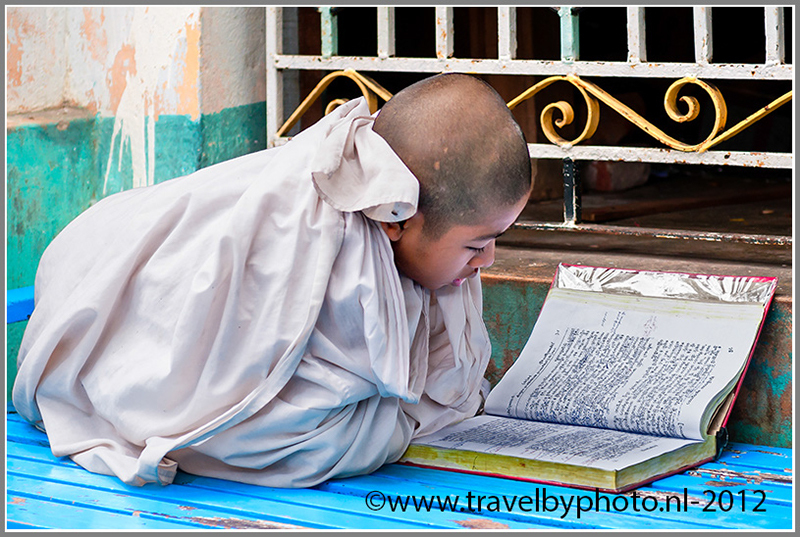 The monks learn diligently. 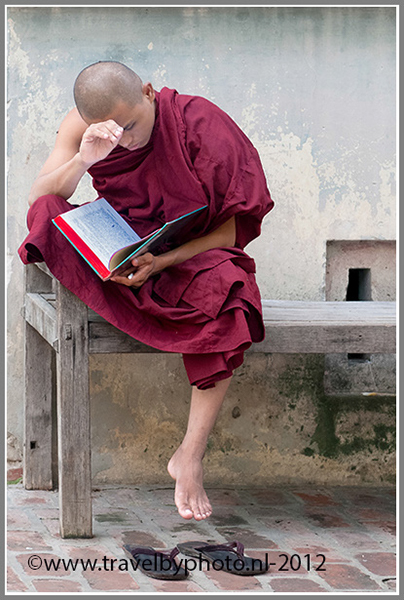 Often the monks do sentry-go totally concentrated on their scriptures chanting the texts from their books. The novices are dressed in white. The monks already had their meal of the day when we visit the Monastery. New food for the next day is prepared in very large pans in a big kitchen crowded by fly, bbrrrr. Our friendly guide gives a lot of information and answers all our questions but he also gives us room to wander around undisturbed on ourselves. Everywhere you see drying (red) laundry on clotheslines. We have an extensive conversation with one of the old masters of the monastery who receives us in audience. He let us know to be very proud of the fact that many of his students hold Buddhist lectures everywhere around the World. At our request we visit a number of antique shops. 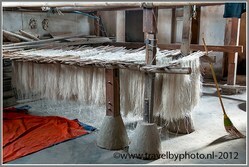 Our guide sorted out one who sells all kinds of sculptures and rugs. We are immediately charmed by one of the Buddha statues we see in the shop but we cannot agree on the price. So we leave the shop empty handed and visit some other shops. We see a lot alternative Buddha statues, but none comes close to the golden Buddha we saw in the first shop, so .. we talk to the guide and ask him if he is willing to call the first shop, with a new bid from us. And yes he is and our counter-offer is accepted, We are already well away from the shop, so it takes quite a lot extra time to collect our new friend Buddha But it is really worthwhile. Nice! The Buddha will get a place of honour in our house in Holland! Our visit to Mandalay comes to an ending. 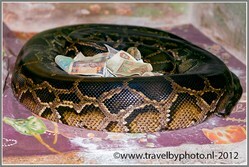 On our way to the airport we will visit one more spot: the snake temple of Paleik. 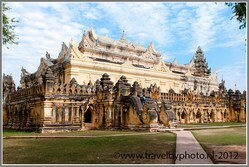 A very different temple then the temples we have seen before in Myanmar. There are also a lot of pilgrims in the temple. 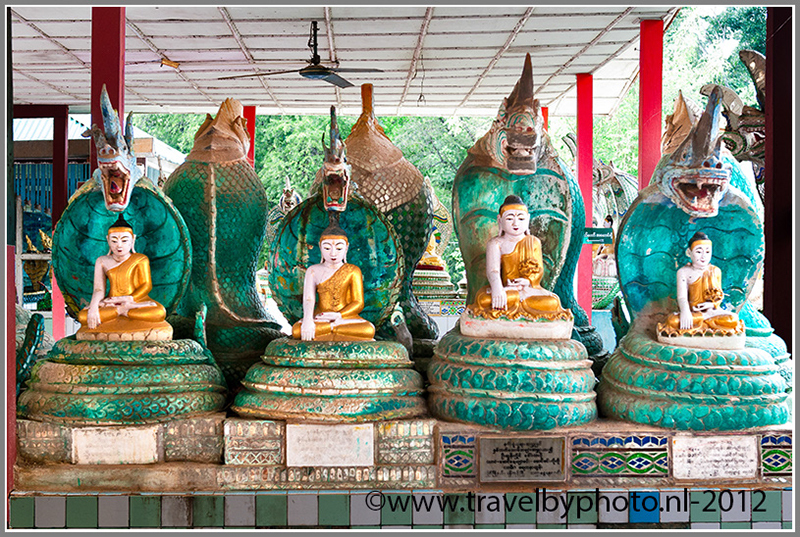 We discover three living pythons near and up the golden Buddha statue. 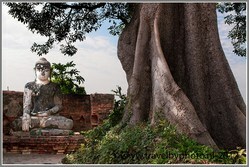 One of the snakes has positioned himself at the head of the Buddha himself! The snake keeper explains that the snakes are fed every morning at 11 o'clock. We are petting the pythons. They move a little when we tough them and they feel cold. The entire temple has a special atmosphere. 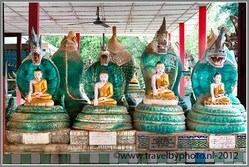 Many Buddha's under snakeheads. We Nice stop again! We had a busy, but great day in Mandalay. Our guide was super. We drive to Mandalay airport. We have a good flight and even get a sandwich and a banana muffin, coffee and juice on board. 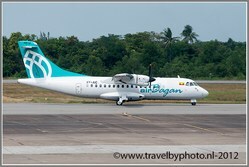 Good service by the local air carrier Bagan Air! 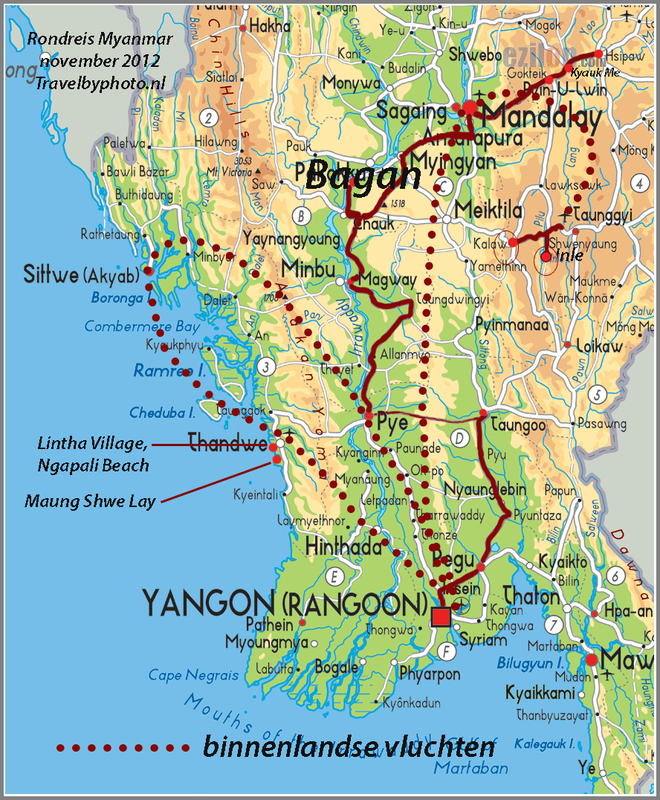 At 7 o'clock in the evening we land in Yangon (map). The temperature is 30 degrees. Unfortunately, there is no one to collect us at the airport. Apparently they forgot us. Very annoying; directing flaws are starting to pile up now. We continue to wait for a while. Nobody. Finally, we hand over our Khiri Travel business card to the people of the security. 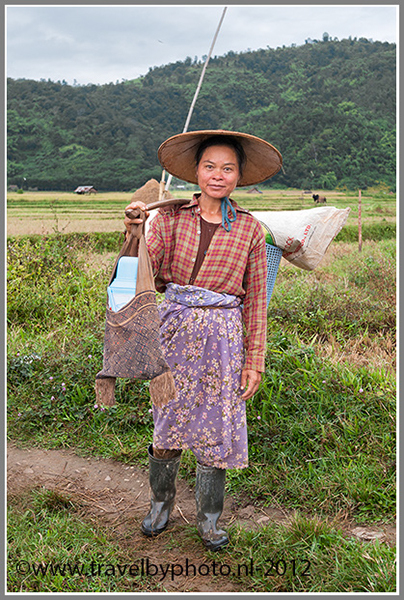 They work hard to call out for us, but do not get Khiri Travel on the phone! Eventually, with the assistance of an employee of the Sand Hotel (!) who is on the airport to collect a guest of his hotel, we manage to find a save taxi to transport us to our own hotel. It's about an hour drive to the hotel. Our friendly taxi driver does not abuse the situation. He asks only 8 euros and is very happy with the 2 euro extra he gets as a tip! When we arrive in the hotel there is still no notice of Khiri Travel. We go to the room and write them an email. 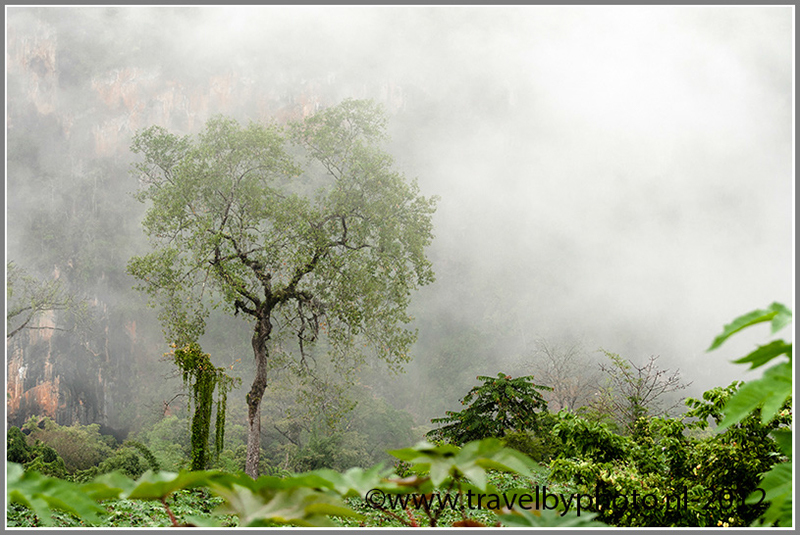 We hope to hear something soon, because the next morning we fly to Thandwe, and it would be nice to know in time if there is someone to transfer us to the airport (as agreed). Get up on time. Good breakfast, scrambled eggs, coffee and fresh fruit. Back in our room we are told that someone from Khiri Travel waits for us in the lobby. 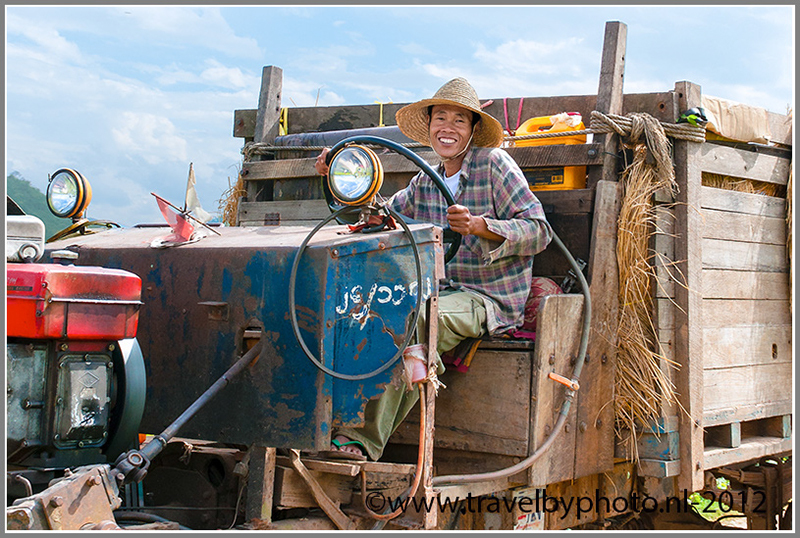 We go down to where we meet a nice English employee of Khiri Travel. He apologies for the fact that it has gone wrong yesterday at the airport. Transportation today will be organized by them. We will be picked up at the hotel at 09.45 a.m. Very thoughtful of Khiri Travel that they come and explain the matter personally. We get our money for the taxi back and a bottle of Burmese wine. Well, with this service irritability slips away quickly. 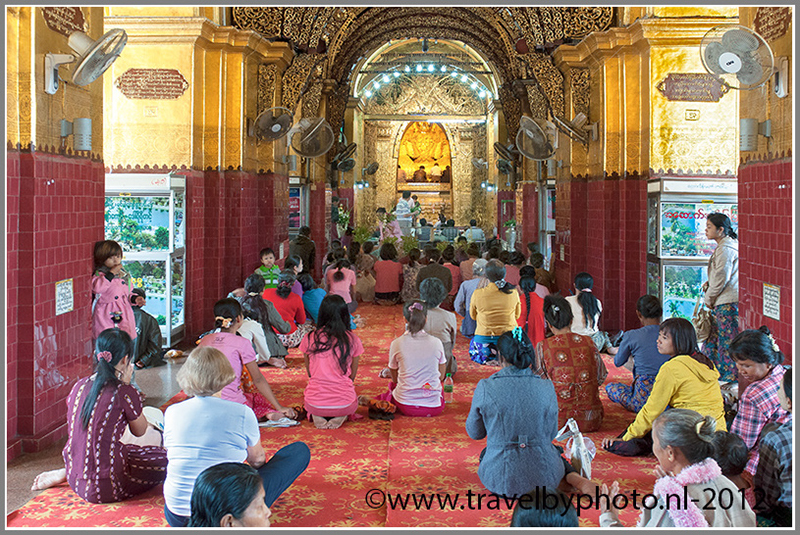 Ingrid asks whether it would be possible to arrange a guided tour for our last day in Yangon when we return from the cost and they say that they will do so. Everyone in Yangon is busy today; the situation is hectic because president Obama will visit Myanmar / Yangon the next day. Tomorrow, when Obama arrives all air traffic will be disrupted so we are glad we leave today.